Our dear mother, Gladys Tuttle Andersen, 89, passed away on Aug. 25, 2018 in Gunnison. Gladys was born in Manti, Utah on July 1, 1929 to William Ambrose and Alice Davenport Tuttle, the eighth of nine children. She grew up in Manti, attended local schools and graduated from Manti High School in 1947. She attended Snow College where she was a cheerleader. She married her eternal companion, Roger Cyril Andersen on July 28, 1950 in the Manti Temple. They started their married life together in Gunnison and were blessed with four daughters. He preceded her in death in 1992. 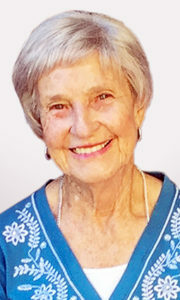 Gladys was involved in community and church activities, and volunteered at the Gunnison Valley Hospital for many years. Gladys served in the Relief Society, Primary and many years in the Manti Temple. She was instrumental in implementing the Cub Scout program in Gunnison Valley. She received the Silver Beaver Award for her service in scouting in 1976. She enjoyed serving others and spending time with friends and family. She never missed an opportunity to share her testimony and love of the gospel. She knew that families were forever. Gladys is survived by her children: Mitzi (Norman) Mecham, Logan; Janice (David) Dalley, Riverton; Suzanne (Jim) Sanders, Gunnison; and Cynthia (Dan) Gagon, Provo; 17 grandchildren and 40 great-grandchildren; her younger sister, Wilma (John) Hougaard, Twin Falls, Idaho; and numerous nieces and nephews. She was also preceded in death by her parents; grandson, Nicholas Sanders; four sisters and three brothers. Funeral services will be held Wednesday, Sept. 5, 2018 at 11 a.m. in the Gunnison Stake Center, 80 West Center Street, where friends may call Tuesday evening from 6-9 p.m. and Wednesday morning 9:30–10:30 a.m. Interment will be in the Gunnison City Cemetery.